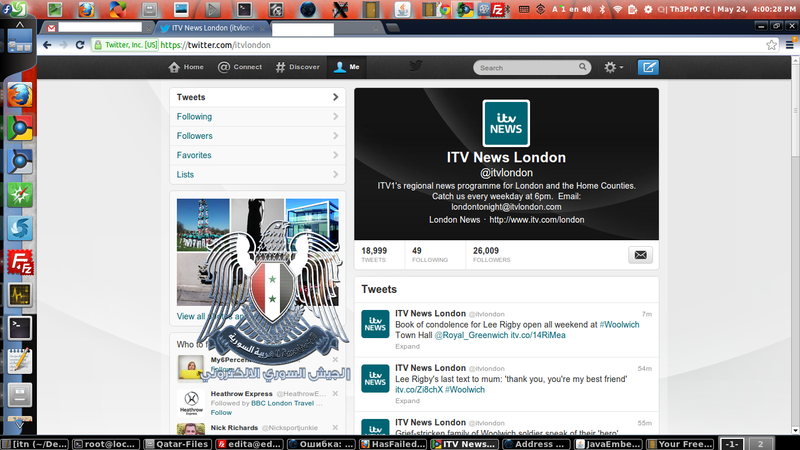 A screen capture provided by a hacker with the Syrian Electronic Army purports to show the Twitter feed of ITV News after it had been compromised on Friday. The Twitter account for the London bureau of ITV News was compromised on Friday just a few days after the social network service rolled out extra security meant to prevent such attacks. The Syrian Electronic Army claimed responsibility for the attack on ITV News London’s Twitter feed on Friday. It was the latest attack by the hacking collective against online accounts used by western news services. The attack comes a few days after Twitter rolled out “two-step authentication,” an optional security measure that prompts a Twitter user for a code generated by a mobile phone after said user logs on to their profile. The code generated by text message must be entered before the profile can be fully accessed. A spokesman for ITV News told Reuters that the account was compromised via a phishing email, which the SEA has used before as a method to compromise accounts. The spokesman said ITV was unaware if the optional two-step authentication feature was active on the Twitter account that was compromised. However, a hacker with the SEA who uses the moniker “Th3Pr0” told The Desk Friday afternoon that ITV News had not enabled two step authentication on the account it compromised. Th3Pr0 provided The Desk with a screen capture showing what appeared to be the ITV News London Twitter account after it had been compromised by the SEA but before the collective published tweets on the feed. Members of the SEA have been forthcoming to The Desk in the past with information about their activities. The group, comprised primarily of four students who carry out the cyber attacks, says they are targeting western news organizations for spreading “unfounded, fabricated (and) forged” reports on the civil war in Syria. The group has attacked the Twitter feeds of The Onion satirical newspaper, the Financial Times newspaper, France 24 and others. A recent attack on the Twitter account of the Associated Press briefly caused the Dow Jones Industrial Average to drop when hackers published an erroneous tweet alleging the White House had been bombed. The Verge: Is the SEA pro-government propaganda or a bunch of trolls?